Thursday July 11th 1895 I did baking and swept the rooms up stairs this forenoon. I worked a little on my tidy in the afternoon. Will went to the valley. After supper the boys set out cabbage plants and I went to help them. A letter from Laura Mason she is coming soon. Friday July 12th 1895 I got my work done early. The girls and the children came out from home for the day. Ida stayed all night but Hattie went home before supper. Mr Thomas and family called after supper. a hot day. 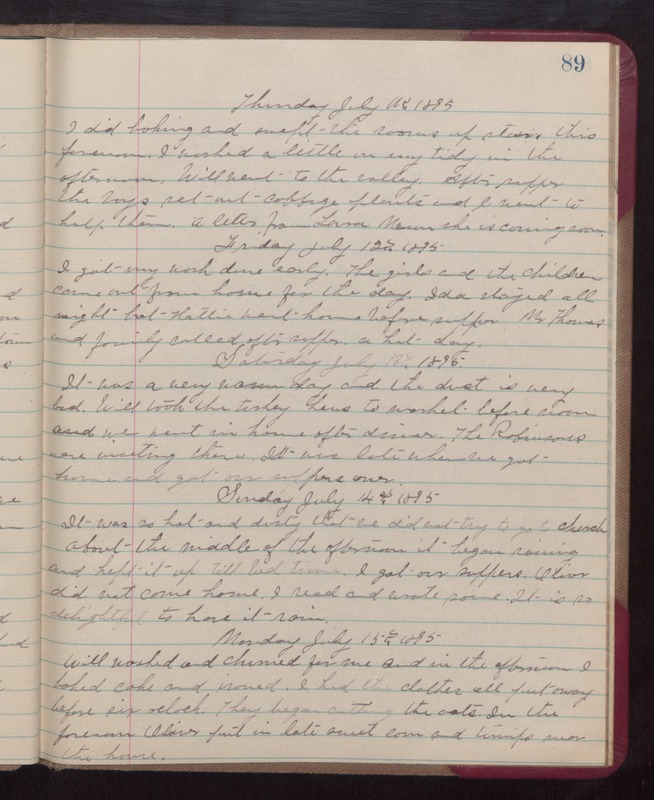 Saturday July 13th 1895 It was a very warm day and the dust is very bad. Will took the turkey hens to [worhel?] before noon and we went in home after dinner. The Robinsons were visiting there. It was late when we got home and got our supper over. Sunday July 14th 1895 It was so hot and dusty that we did not try to go to church. about the middle of the afternoon it began raining and kept it up till bed time. I got our suppers. Oliver did not come home. I read and wrote some. It is so delightful to have it rain. Monday July 12th 1895 Will worked and churned for me and in the afternoon I baked cake and ironed. I had the clothes all put away before six oclock. They began cutting the oats. In the forenoon Oliver put in late sweet corn and turnips over the home.